The Kia K900 full-size luxury sedan, launched for the 2015 model year, continues into 2016 with a number of changes, including a new V6 engine, expansion of available features, and revised model lineup. Updating of the grille and rear end added a little chrome to the latter. New 18-inch alloy wheels go on 2016 Kia K900 V6 models, while V8s get 19-inch chrome wheels. Inside, the touchscreen has expanded to 9.2-inch size. Paddle shifters are now available on all versions. A Smart Power Trunk opens the lid automatically when it senses the key fob for more than 3 seconds. Like the South Korean automaker’s smaller, mainstream models, the K900 aims to deliver great value. While Kia’s smaller cars benefit from crisp, European-style lines, the big K900 is less distinctive. Though the sedan is quiet, comfortable, and spacious, including the back seat, it falls somewhat short on distinguishing, upscale features. Judged by styling, overall tone, and capabilities, the K900 could be said to score between premium and luxury. Like other Kia models, though, the K900 beats traditional competitors on price, which in itself can lure new buyers to the brand. Shoppers seeking to move up from a mass-market model are especially likely to be attracted to moderate-cost luxury. Two engines are available: a 311-horsepower, 3.8-liter V6 and a 5.0-liter V8 that cranks out 420 horsepower. All K900 sedans have an 8-speed automatic transmission and rear-wheel drive. The V6 engine comes in Premium or Luxury trim; the V8 is Luxury-only. Leather and wood trim help to provide a comfortable, appealing interior for upscale buyers. Behind the wheel, the K900 feels somewhat heavy, but is sufficiently enjoyable to drive. It lacks both the rigid solidity of a big Mercedes-Benz sedan and the sporty, passionate feel of a BMW. Yet, the K900 is predictable and easily understood, in addition to the virtues of comfort and quietness. Fuel-economy estimates are about average, meaning less than thrifty. The V6 model is EPA-rated at 17/26 mpg City/Highway, or 20 mpg Combined. Moving to the V8 drops the rating to 15/23 mpg City/Highway, or 18 mpg Combined. Active safety features include adaptive cruise control and an advance collision warning system with automatic emergency braking. K900 V6 Premium ($49,000) comes with the V6 engine, leather seat trim, heated front and outboard rear seats, power front seats, HID headlights, dual exhaust, power-folding mirrors, tri-zone automatic climate control, 14-speaker audio, navigation, power trunklid and rear sunshade, and 18-inch alloy wheels. Front/rear cameras and parking sensors also are included. The panoramic sunroof includes a power-retractable sunshade. K900 V6 Luxury ($54,900) adds paddle shifters, Lexicon Logic7 900-watt 17-speaker audio, Nappa leather upholstery, wood trim, a heated wood/leather steering wheel, and shift-by-wire transmission control. K900 V8 Luxury ($61,900) tops the lineup, including a 12.3-inch LCD instrument cluster, LED headlights, and 19-inch chrome/alloy wheels. Safety features include a surround-view monitor, blind-spot detection, lane-departure warning, and rear cross-traffic alert. Eight airbags are standard. VIP and VIP Plus option packages add long lists of features, including active-safety items. Though the K900 has been criticized for bland, unadventurous styling, it’s a long sedan, displaying the classic proportions of a luxury model. In addition to a long hood and shorter but tall trunk, it features a steeply angled windshield and back window. Overhangs are short, too. A rectangular, chrome-surrounded grille, low and upright, serves as its most distinctive element, sitting between swept-back headlights that blend into a conventional sedan profile. On V6 models, high-intensity-discharge headlights feature dynamic bending; the V8 gets LED lights. Wraparound LED taillights bring up the rear. Front fenders hold chrome-ringed vents, but they’re non-functional. Even if the overall design breaks no fresh ground, build quality is a K900 strong point. Refreshingly straightforward, including logically organized dashboard controls, the K900 cockpit is stylish and comfortable. Crisp digital graphics are among the easiest to interpret and use. Soft-touch materials, accompanied by aluminum trim (wood on Luxury models), help impart a classy look. Yet, the dashboard has some hard piano-black plastic. Upscale touches include three-zone automatic climate control and heated outboard rear seats. Luxury models get a heated wood/leather-trimmed steering wheel. A console-mounted knob lets the driver navigate menu options on the central 9.2-inch touchscreen display. Large, conventional knobs also control such functions as audio volume. Nappa leather, which looks and feels good, covers the seats and other surfaces of Luxury models, matched by glossy wood trim. Airy and bright, the roomy cabin is easy to enter, and also to exit. Front seats are adequate, but not particularly expansive. Knees of a tall passenger might hit the glovebox lid if it’s opened. In the rear, on the other hand, space is bountiful, while upholstery is pleasurably comfortable. Motoring passion might be in short supply, but the K900 delivers wholly adequate performance. Over-the-road behavior cannot match that of German luxury brands, however. The V8 engine, in particular, provides sufficient power to propel this relatively heavy sedan without faltering, though response lagged a bit when the gas pedal was floored, exacerbated by imperfect transmission shifts. Also when accelerating strongly, the exhaust gets substantially louder, emitting a rather ordinary, mechanical sound. The transmission can be shifted into manual mode without paddles (which are standard on Luxury models). Although the K900 suspension is nicely damped, it’s tuned more for comfort than for roadholding. That’s no surprise. Regardless, the car’s stability and traction-control systems keep it well-behaved, even if pavements become lumpy or you’re heading through cracked rural roads. On most surfaces, the K900 is quiet and comfortable. Noise-reduction techniques include laminated glass and installation of underbody trays to curtail air noise. Three drive-mode settings – Normal, Eco, and Sport – alter the transmission’s shift points and modify steering feel to suit specific conditions. Performance is reduced in Eco mode, but not in the suppressive manner that’s common on smaller cars. Sport mode provides a bit more responsiveness than Normal. 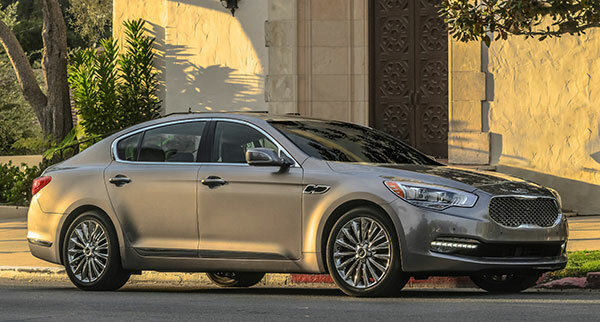 The Kia K900 is at the upscale end of a comprehensive line of smartly styled, feature-loaded models. Customers who associate the Kia brand with smaller, economy-focused cars might have trouble accepting the top-end K900, despite its economic value. The K900 delivers quiet comfort.